Jain Dharm, or the Jain religion was historically an extremely non-materialistic religion. The desire for materialistic things was frowned upon. The only quest that was worth pursuing was that for moksh, or salvation - the freedom from the cycle of birth and death. Pure Jains went to the temple not to ask for material comforts - money, a good job, a good spouse, good health etc. In fact, the deities in the temples - the tirthankars, it is believed, cannot even give these things. They have already attained moksh showing us the path to it. In recent times, however, many changes have crept into this religion. A lot of people have begun expecting material benefits from the religion. A religion that was totally anti-materialism is being used to promote materialism and this is really, really sad. Take for example, the Mahavir Janm Vanchan day during the Paryushan Parv. On this day, there is this tradition of ghee boli. This is when representations of the fourteen dreams that Trishala Devi, the mother of Lord Mahavir had are bid for by the Jain Sangh. I will not go into the demerits of this here. You should visit this link where it is beautifully explained. What I want to highlight is the relative bids for the different dreams. Trishala Devi got fourteen dreams after conceiving the Lord. The fourth of these dreams was of Goddess Lakshmi. The bid for the fourth dreams surpasses all other bids. People bid for this dream many times more than the other dreams. Isn't this entirely wrong? 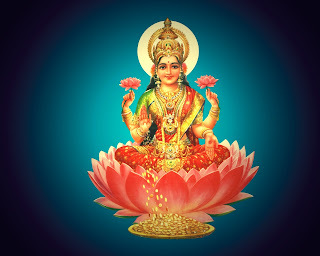 Isn't it obvious to all that people are bidding more for this dream in the hope that Goddess Lakshmi will bless them and get them more wealth? This is completely against the basic tenets of the dharm that Lord Mahavir propounded. It is completely against the very fundamental principles of the original dharm that Lord Mahavir and indeed, before him the other Tirthankars preached. And yet, year after year, the Jain Sangh continues this tradition in the garb of raising funds for the activities of the temple for the entire year. I say, STOP! Let us do less activities. Let us spend less. Let us not have so many swamivatsalyas or community lunches. It is better to do less than to do more by insulting our Tirthankars in this way. The shameless 'pleasing' of Goddess Lakshmi continues even after the boli is completed. There is bidding for who will carry the her statue during the procession that is taken out after the Paryushan Parv is completed! People will request for the statue to be brought into their shops on the way of the procession. At every step, the Jain sangh is knowingly encouraging this blatant and completely wrong practice of giving Goddess Lakshmi more importance than the rest of the dreams. The bid for Goddess Lakshmi is just one of the wrongs that is happening in the religion. There are multiple others like poojas and artis for devi-devtas, presenting 'navlakha haars' to devis, adorning the idols of the tirthankars with expensive ornaments, the list is endless! When did Jain dharm become such a showy and pompous religion? This was not what Lord Mahavir wanted! I am really sorry to say, this entire exercise has the blessings of the Jain sadhu-sadhvis or the Jain clergy. They probably like to see high amounts being bid in their presence dropping hints that their presence has inspired the laity to bid increasingly high amounts! If the sadhu-sadhvis take a strong stance on this, it would be enough for this practice to be put to an end immediately. But will they? I would think not! The only thing one should follow any ritual in Jain dharm for is moksh. Nothing else. Not more money, not to get rid of health problems, not to give birth to a child, not to ensure that your business does well. Practising Jain dharm for all these things is not only ineffective, it is totally wrong and I can say with a certain degree of certainty, that it is only making us attach bad karm to ourselves. Some people argue that if we do not allow these changes to come in, Jains would turn to other religions to solve their material problems. I say, LET THEM! We should never compromise on the basic principles of our religion just so that people who do not understand it go elsewhere. What is happening, unfortunately, is that even people who understand the basic principles start indulging in this shameless quest for materialistic benefits from the religion. What have we gained from this? What have we lost? These are two very fundamental questions every right thinking Jain must answer. Couldn't agree more...although I feel a little guilty myself of doing this. Moreover, I don't think I'm qualified enough to agree or not. I've not been very close to religion in the last 4 years. I do find it really peaceful when I'm in a temple. Can't really explain that feeling. I really need to find myself again and consciously make an effort to visit the temple every now and then.